It’s the funeral for ROCKET RED. Several members resign from the team – who will be left? In a Russian cemetery the JLI are honoring their dead teammate. While their they are attacked by Malik the twin brother of Lightweaver who thrashed the team in Justice League International #8. Batman manages to talk down Malik after they defeat him. They allow him to leave and Batman and Batwing leave the team. Everyone else stays together in hopes of making the world a better place despite no longer having UN funding. 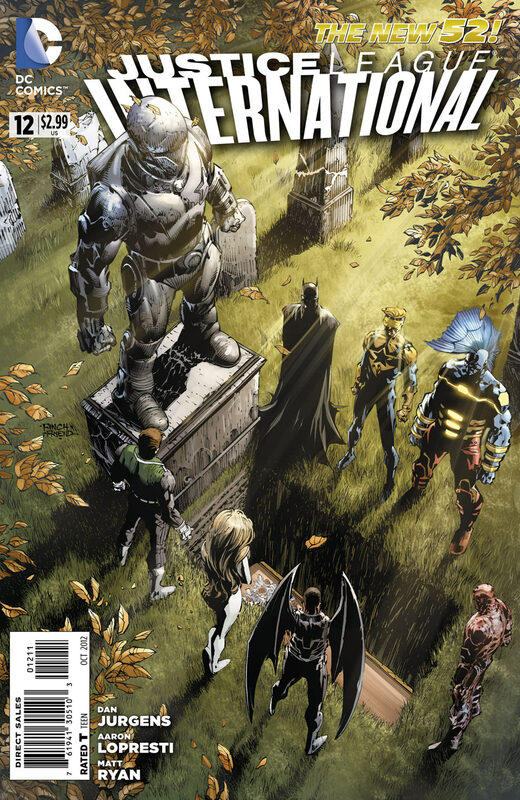 Cover-Simple and to the point, a funeral with the heroes gathered around the grave. Black Heroes- Batwing was wallpaper, Vixen appeared but we also got Malik, Lightweavers twin brother. Art-Aaron Lopresti’s art looks good on every page and the colors from HI-FI really enhance the story. The issue felt like filler despite being the finale issue of this run.